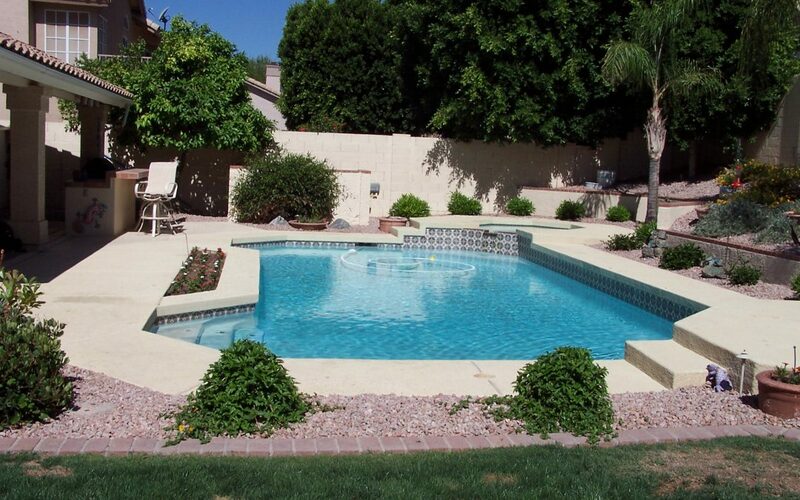 The beauty of a vinyl liner swimming pool for many Arizona families is that it is a low maintenance, lower cost pool for the family. In this Pool basics 101: caring for a vinyl liner pool the pool service professionals from Express Pool Care offer tips for cleaning that make vinyl pool care unique and different from cleaning and maintaining a concrete or a fiberglass pool. When you want a swimming pool that has water that is always ready to swim when you’re ready to jump in, proper and ongoing maintenance and care is crucial to that happening. Pool maintenance is a job that a do-it-yourself pool owner can handle, but many of our customers hire us because they’ve found it’s less expensive to hire us and they want to swim, not clean the pool when they have free time. Temperatures will more than likely hit the triple digits this summer and wouldn’t you rather have a member of our service crew working on the pool so you can just enjoy it? If you opted for a vinyl liner pool you probably did so because of its price point, its flexibility of design and how quickly it could be constructed. A vinyl liner pool offers flexibility in color, shape and size and can fit into virtually any shape and size backyard space. When we care for your vinyl liner swimming pool we will also check for any potential rip or tear prone areas and patch those holes or rips that can be easily done. Sometimes, you may need to have the pool drained below the rip in order to have it repaired. If you institute a no jewelry or sharp objects in the pool rule, the chances of rips and tears are diminished. Algae can grow on a vinyl liner pool, but not as quickly as in a concrete pool. The reason that a vinyl liner pool isn’t as prone to algae growth as a concrete pool is that vinyl liners are smooth and concrete is rough. The rough construction provides a place for algae to nestle in and wait for the conditions to be ideal for it to bloom. Keeping the chemicals properly balanced is more important in a vinyl liner pool as it can fade if the chemicals are out of balance. Fading isn’t as much of an issue with fiberglass pools or concrete pools. When you work with a pool service contractor he will test and balance the water chemicals on his service visits. It is also important for you to test the water between service visits to assure yourself that everything is still balanced. If you notice a change in chemistry, call us or if you understand how the chemistry works, you can add some chemicals to keep it balanced. If you do this, please let us know at our next visit because if the wate chemistry is getting out of balance there could be equipment or usage issues we will want to talk with you about. No matter what kind of swimming pool you have, we can keep it cleaned and maintained on your behalf. We know that when you want to swim, you want to swim!